NOGALES, Ariz. (CNS) — A shirtsleeve waved from the top of the border fence like a signal flag. 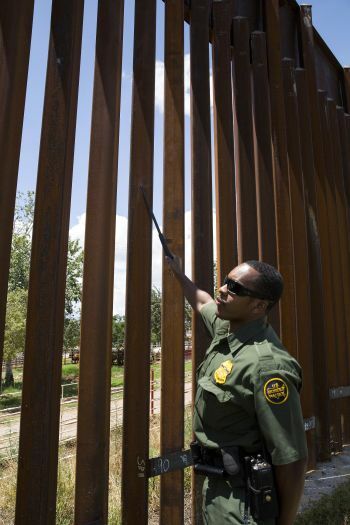 “Someone came over here recently,” said Border Patrol Agent Bryan Flowers pointing to the shirt and rubber-sole skid marks left on the 20-foot-tall rusted steel fence. Flowers has a keen eye for spotting signs of people on the move. He can make out fresh footprints in the dry desert sand and easily spot newly discarded water bottles, backpacks or clothing. 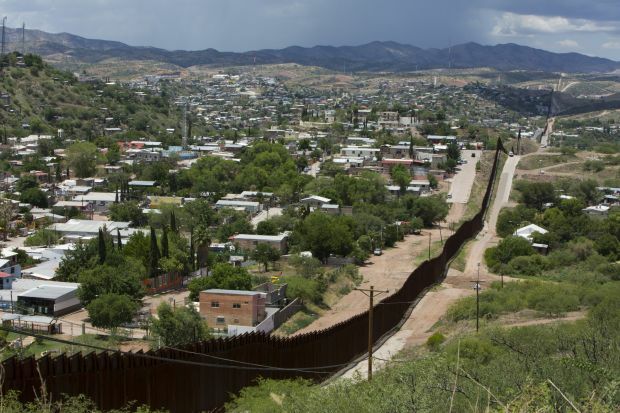 A former teacher, he is among the 4,100 agents in the Tucson sector of U.S. Border Patrol charged with security along 262 miles of linear border extending from Arizona’s Yuma County to the New Mexico state line. The agents make daily arrests. Among those taken into custody are people looking for a better life, those seeking jobs or to be with family and hardened criminals, including drug smugglers, human smugglers and traffickers. Flowers, a public information officer, recently gave Catholic News Service a tour of Border Patrol operations in southern Arizona. “This border area is safer today than it’s ever been,” he said, outlining infrastructure improvements the agency has made over the last decade. Upgrades in fencing, roads and monitoring technology, as well as an increase in the number of agents, have helped reduce the number of apprehensions made in the Tucson sector. Even as apprehensions are down from an all-time high of more than 600,000 in 2000, the sector remains one of the Border Patrol’s busiest regions. Last year it took into custody 120,939 people, nearly 29 percent of all Border Patrol apprehensions that year. 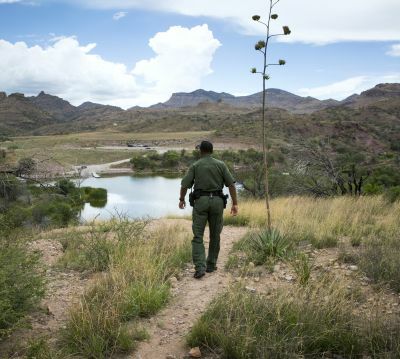 The Tucson sector also seized more than 1.1 million pounds of marijuana in 2013, accounting for nearly half of all the marijuana confiscated by Border Patrol the same year. Just before 11 a.m. July 17, the patrol’s Nogales station was processing more than 20 people — including women and children — arrested by agents a few hours earlier. Unlike the Texas Rio Grande area, Arizona’s southern border did not experience an uptick in apprehensions of unaccompanied minors over the last reported year. The number of family-unit apprehensions in the Tucson sector for the same period did increase from 2,130 to 3,117. (A “family unit” is defined as a child or children accompanied by one or both parents). In June and July, the Border Patrol’s Nogales station temporarily housed hundreds of undocumented children who had been apprehended in the Rio Grande sector. Bishop Gerald F. Kicanas of Tucson said he and other community leaders continue to converse with Border Patrol about the treatment of people in its custody. Most recently the focus has been on the unaccompanied children, who he said need pastoral and social services and legal representation. The bishop said he had asked permission to celebrate Mass for children at the Nogales station, but his request was denied. Bishop Kicanas also said there is still much concern about a 2012 Border Patrol shooting incident that left a Mexican teenager dead on the Sonoran side of the fence near Nogales. An agent or agents reportedly shot several times through the border fence as rocks were being thrown at them. “When you have as many Border Patrol agents as there are in the Tucson sector, it’s very difficult to make certain that all of them are following all the directives and rules and that they treat everyone with dignity and respect,” Bishop Kicanas said. At the same time, he added, it’s also helpful for those in the community to be mindful that agents are law enforcement people, not health care or social workers. Flowers said that although Border Patrol agents’ first responsibility is to secure the border, they do show compassion and care for the individuals in their custody. Border Patrol’s monitoring and detection tools include remote video and radar surveillance; mobile surveillance; K-9 units; infrared scopes; radiation monitors; road checkpoints; and unmanned aerial systems, often referred to as drones. Armed agents patrol paved roads and off-road areas using marked and unmarked vehicles, ATVs, horses, and bicycles and by foot. The U.S. Customs and Border Protection’s Office of Air and Marine provides air support. Even as Border Patrol bolsters its abilities to keep criminals from sneaking into the U.S., it witnesses breaches every day. The Tucson sector reported that in early July alone its agents had seized five vehicles, more than $1.1 million in narcotics and apprehended 23 people in connection with criminal cases. Flowers said criminal elements have means to monitor Border Patrol from Mexico and inside the U.S., and they employ a host of tactics, including violence, to distract or intimidate agents. And does fencing help in the overall border security strategy? Fences serve mainly as obstacles to those who are determined to make it over, said Flowers. Fencing does provide more time for agents to respond to illegal crossings. But it’s only one facet of Border Patrol’s overall plan to deter, detect and identify unlawful activity, Flowers said.